Surgery Day is closing in, and there is so much left to do. Documents to get in order, last meals to eat, and hoops to jump through. One of the things that you are not told prior to embarking on the surgical journey is that there are an awful lot of hoops you must jump through to make the procedure happen. At least there are with my doctor, but I realize there is a reason for all of the hoops–he is trying to keep me as safe as possible so that complications are avoided both during and after the procedure. He’s also trying to make sure I have all the tools in my toolbox that I need to be successful with the sleeve he is going to craft for me in a few short weeks. Attend an informational seminar. This was to learn about the surgical options available to me and to make initial contact with the surgeon. Have a surgical consult with the doctor. At this meeting, Dr. Nicholson and I discussed what my options were and which surgery would be best for me. We agreed that the sleeve was the best choice. Have a psychological evaluation. My insurance company required this, but it is also a pre-requisite of my surgeon. Meet with a dietician to learn about pre-op and post-op eating plans. 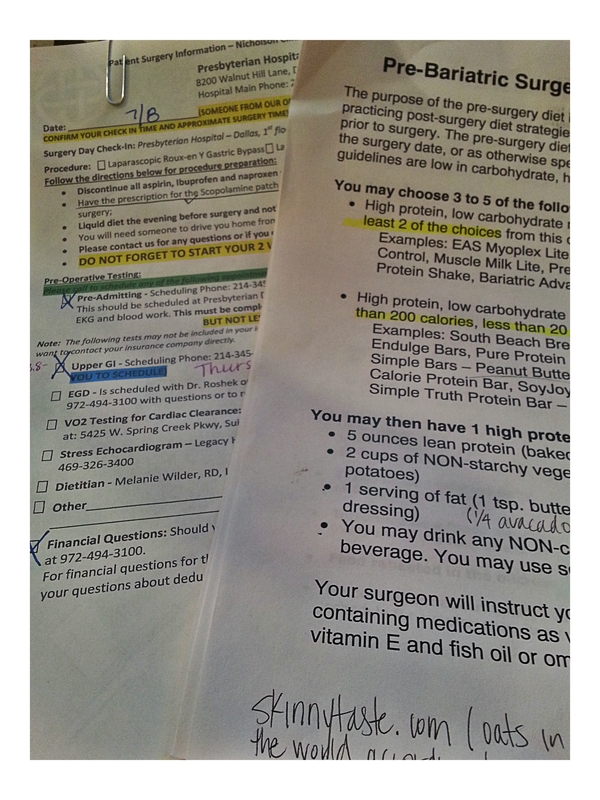 This was necessary so that I could learn about how my eating behaviors and patterns will change–and will they ever change!–prior to having surgery as well as afterward. Attend WLS support group meetings. This has actually been quite useful. I’m glad my surgeon requires attendance at support group meetings, because it is good to hear about other people’s experiences with the surgery, and to see what they’ve learned, where they’ve stumbled and where they’ve succeeded. Fill a prescription for a scopolamine patch. I have to put this behind my ear the night before surgery to lessen nausea. Have bloodwork drawn. This was done to establish baseline glucose, cholesterol, lipid and other health indicator levels. I have this done every six months anyway since I am diabetic, so I just had the surgeon’s people fax the order to my primary care physician so she could have it done for me. I figured why should I get stuck twice for the same exact test results, and more importantly, why should I pay to get stuck twice? Have an upper GI series. Dr. Nick wants to rule out a hiatal hernia (which I suspect I likely have anyway, with the wicked reflux I get sometimes). If I have a hiatal hernia, the plan is to fix it while I’m getting my sleeve made. Have an EKG, to make sure my heart is in good shape for surgery. I had one a while back and nothing was wrong then, so I’m hopeful that things are all good on the cardiac front. If not, then a stress test may be in order. And since this chubby girl doesn’t run, a treadmill test is out of the question. I’ve had a stress echocardiogram before, but it was a dobutamine stress test which is possibly one of the funkiest feeling diagnostic tests I’ve ever had. You’re given a drug that speeds up your heart rate but you’re lying perfectly still, and a technician is using an ultrasound wand to image your heart with Doppler imaging. It was weird to lie still with my heart racing as though I’d been running quite a bit and watch the blood flow through the valves of my heart on a Doppler radar looking thing. Get legal documents in order. I need to craft a living will and paperwork for granting medical power of attorney in the event that God forbid, something goes wrong during my surgery. Hell, I might as well just draft a will since that’s something I’ve not bothered to do. Arrange for post-op counseling. I want to work on my head issues once my stomach’s been removed. 90% of this fight is going to be mental, and I want to be sure I am successful so counseling of some sort is going to be critical. Actually have surgery. And we all know what happens there. As the days pass by, it’s becoming more and more real that this is actually going to happen. The words I’ve been speaking since January–“I’m going to have a gastrectomy”–are actually going to be realized. I’ve never been more excited, scared and nervous to spend some quality time on a surgeon’s operating table. It’s really going to happen. REALLY. This entry was posted in pre-op, vsg, weight loss surgery and tagged counseling, dietician, medical testing, pre-op, pre-op testing, preparations, sleeve gastrectomy, support group, surgeon, VSG, what's up doc?, WLS. Bookmark the permalink.